One of top 2016 Student Athletes on the West Coast Ian Carter of Serra HS of Gardena, California. Ian has been showing out grabbing major attention from college recruiters and media outlets. 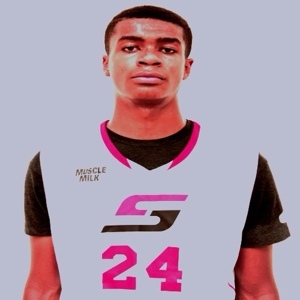 Mid Major Hoops Report has brought him to our “Players Corner” where we at MMHR are proud to highlight him as one of the fastest rising prospects in the 2016 Class…. Ian Carter:I like to play up-tempo with tons of fast break dunks and good transition passes. If I get the rebound with an opportunity to break, I’ll take it myself. I can shoot the ball pretty well and I think my handle is solid, but they both could get better. Ian Carter:I try to talk a lot on defense, it gets the opposing offense rattled and us hyped. I also think that being able to take charges makes me stand out too. Ian Carter:Defense, I have been able to guard every position so far in the season. I have guarded 5’10” point guards to 7 foot centers. Ian Carter:I need to develop more confidence in my ability; I feel that I work out often enough that if I gain more confidence my game will go to another level. In terms of skill, I have been working hard on my guard skills for the upcoming AAU season. Ian Carter: So far I have no offers, but I have interests from Columbia, New Mexico State, Loyola Maryland, and Holy Cross. Ian Carter:The best impressions that have been made so far as recruitment goes is by Columbia’s Todd Goldman and head coach Kyle Smith. Ian Carter: So far I really like the idea of going to Columbia, but if I had a chance to go to Ohio State, Duke, UCLA, or Syracuse I would be all in. Ian Carter:I have visited Cal State Fullerton and LMU with my non-biological older brother, Ron Freeman. I plan on going on a few unofficials. Ian Carter:It doesn’t matter really. Any place where I could play basketball for a good fan base would be great. Ian Carter:I spend tons of time working on my game. I make sure that I go hard every time because if I don’t, I’m allowing someone else to get better. Ian Carter: I was about 6 playing for the little YMCA league when I first tried basketball out. I didn’t play on any competitive teams until about the seventh grade though. Ian Carter: In terms of basketball I would like great fans, a good relationship with the coaching staff, and teammates that are willing to work as hard as me. In terms of academics I would prefer smaller classes and professors willing to work one on one. Ian Carter:My parents are my biggest supporters, but I feel that the most significant coach that I have ever been with was my seventh grade AAU coach. I learned a lot about footwork there. I can say that most of the coaches I have been with are big parts of where I am now. Ian Carter:I think the best moment was when I first dunked a ball on an actual ten-foot hoop. Ian Carter: I want to go undefeated for the rest of my high school season, and I want to get my guard skills up. Ian Carter: I want to become a key player on a division 1 basketball team. Ian Carter: I hate Lebron but he works so hard and plays on such another level that you can only respect what he has been able to accomplish. Ian Carter: Nike shoes fit my feet the best. MMHR would like to give a special thanks to the Carter family for allowing us to interview their son. Good luck on the rest of your season!